As competition season takes full force I wanted to take a moment to talk about some of the struggles that I faced and what I did to deal with them. When I started my first prep I remember girls talking about post show depression and how hard it was to deal with. My first thought was, “Oh, I’m like the happiest person and thats not something I feel like I will ever go through.” Unfortunately, I was very wrong and just two days after my show I woke up and felt the strongest feeling of despair, which was something I had never felt before. I went upstairs and tried to eat but couldn’t choke anything down, so I thought maybe I just needed to go to the gym and get a good sweat on. I was twenty minutes into my workout and I remember doing bicep curls and suddenly I just started to cry. There was absolutely no reason for me to be crying, but I felt this overwhelming sadness that I just couldn’t stop. I just wanted to be back to my normal happy self, so thank goodness, when I woke up the next day I felt back to normal. Later on I read that post show binges, especially on sugar could trigger a post show depression because your body was so acclimated to eating clean that the sugar basically shocked your body. Since that was my first show, I did eat a crazy amount of candy afterwards, so never again after a show will I eat that much sugar. Since then, I have never experienced post show depression. After I would binge I would feel like a failure and force myself to go workout to burn off the extra food I had just eaten. Binging is a viscous cycle and can go on and on and on. But I was fortunate enough that I was able to find a coach that believes in a healthy prep ( Amber Fokken) and she began to add fats and carbs back into my diet. By adding veggies in my diet and more fats I felt like a whole new person and my binging stopped. Another way I was able to combat binging is with the intermittent fasting method. 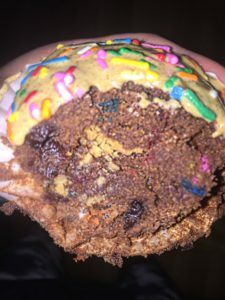 Read more about IF here: Click Here ) Basically you set yourself an eight hour window of time that you are going to eat your meals. Since you are limiting the hours of the day you can eat, you are able to eat bigger meals which in turn will make you feel more full and less likely to binge. For example, let’s say you set your window from noon until eight, you will start eating at noon but have to finish eating by eight that evening. Then you won’t eat again until the next day at the same time. You can start by trying this method a few times a week and see if it helps you the same way it helped me. I also find that when I eat a larger variety of clean foods, I don’t experience any cravings. So this is something I still deal with on a very strong level and unfortunately I don’t have the answer on how to fix it, but I can tell you how I deal with it. When I get to the end of my prep about 4-5 weeks out I don’t sleep at all. I am so used to it that I am able to function the same with or without sleep but regardless, I do use a few tricks to try and knock me out. Tea!! Tea is awesome at relaxing your mind and body, I personally like sleepy time tea. Essential oils are also good at calming me down for the night, I use lavender oil from Doterra. I also take ZMA and sometimes z-quil for those really tough nights and sometimes it does the trick! I hope some of this helps one of you competitors out! Now before we get into it, I want to stress the importance of checking with your doctor before exercising while pregnant, especially with resistance. Everybody is going to be different, and every pregnancy will be different, so take it slow and play it safe because NOTHING is more important than keeping your baby safe! Today’s workout was total body, light weight with high reps and sets! Warm up with 3 sets of pyramid lateral raises. 5 X 3, 5 X 5, 5 X 8, 5 X 10, 5 X 12, 5 X 15 etc… IF THIS IS YOUR MAX YOU THEN GO RIGHT BACK TO- 5 X 12, 5 X 10, ETC… I went light on these, only up to 10 lbs to be safe. Move into seated bicep curls. 15 reps ( I used 10 lbs). Superset with seated overhead extensions with one 10lb dumbbell got triceps. 15 reps. 4 sets. Seated overhead presses. I used two 10 lb Dumbbells. 4 sets of 15-20 reps. Body weighed walking lunges. 20 steps. To warm up legs. Adductor machine- 20 reps superset with abductor machine. 20 reps. 4 sets. Body weighed walking lunges. 20 steps. Light straight leg deadlifts. I used two 10lb Dumbbells. 20 reps superset with body weighted donkey kicks. 20 reps per leg. 4 sets. For the donkey kicks I did them standing with a slight forward lean because that felt more comfortable and safe for my baby. Cool down with 20 minute incline walk. No hands! And last but not least STRETCH! Stretching or doing some yoga is so important while pregnant. Working on your flexibility will help your body adapt more efficiently while you are undergoing so many physical changes. By keeping the range of motion in your joints you are able to avoid postural issues, sciatica pain, connective tissue tears etc. 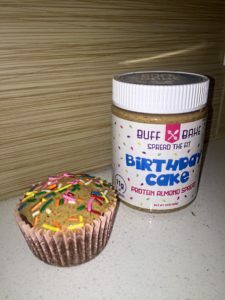 BUFF BAKE BIRTHDAY CAKE CUPCAKES! It’s Sweet Tooth Sunday again and this week I whipped up some mouth watering Buff Bake Birthday Cake Cupcakes! -Chocolate triple zero Greek yogurt! Everyones fitness journey started somewhere and this week ADO Fitness Coach Jennifer Ann shares with us her story. I’ve learned a lot through fitness and it changed my life. Before I began to really “lift” I was a huge cardio bunny. I ate pretty healthy, but I ate a lot and was skinny fat. I was not happy with my body and my self-esteem was low. I felt flabby and the scale just kept creeping up. I would eat super healthy during the day but at night I would drink five out of seven days of the week. I would drink, and after I was buzzed or drunk I would eat a bunch of food and go to bed. I would repeat this yo-yo lifestyle over and over and over and I would lose weight and gain it right back it was very frustrating to say the least. I remember when I began to lift and I would research different exercises to do off of YouTube. The first few weeks at the gym were a little intimidating learning all the new things on all the machines. It made me feel empowered and I knew I was hooked because I loved the way it made me feel. In just a short amount of time I’d say 5 to 6 weeks I began to see changes and I could see myself getting tighter and feel myself getting stronger. I love challenging myself with all the weight and at this time I still would go out drinking but it started to be less and less. This week the ADO Fitness trainers are addressing how their lives have been negatively impacted by fitness to spread some light on issues not everyone speaks about. Coach Jennifer Ann NPC Bikini Competitor shares her story. When I began my fitness journey I jumped right into bikini prep. I was super eager to transform my body and my life. As I began prep I was excited to have a sweet body but knew very little about the mental battle struggles I would go through. My first prep was relatively easy until the last five weeks when I quit sleeping at night. Every prep I’ve ever had around the fifth and fourth week out mark I literally quit sleeping. And by not sleeping I don’t mean I only get 6 hours, I don’t sleep at all. So I’m basically a zombie the last few weeks. Along with lack of sleep I experience what some refer to as “carb brain”. It’s like your the most spacey you can ever imagine throughout the day. I would go to the same grocery store 3 times in one day several times a week and I would literally sit in the parking lot for 20 minutes every time having no idea why I was there. It sounds kind of funny but can be extremely frustrating and time consuming. Lack of sleep plus being on such a low carb intake when you’re used to more can make regular daily activities extremely exhausting. So mental strength is definitely needed at this point to make sure you get your workouts in and not go HAM on food in the kitchen because the struggle is real. The hunger pains sometimes were so strong I have a feeling that was what kept me up at night. The way your brain changes and the way you view food is an entirely new experience. I caught myself day dreaming of cookies on many occasions and watching the food network like I was hypnotized. Temperature wise I’m either freezing or ice cold or so hot that I’m drenched in sweat. I remember my last prep it being freezing out and I was in a tank top drenched in sweat walking around and I looked over to see a 6 ‘4 man head to toe in winter gear and he was staring at me like I was crazy. The reason our body temps change is from the change in hormones but I had no idea why I felt this way. There were many time I found myself crying for no rational reason at all. I am touching on these things because they do happen, but I will say before I prepped in a healthy manner these hormonal issues, struggles, hunger pains and emotions were definitely way more intense. However, the last four preps I noticed around 8 PM I get extremely disorientated from being depleted and I feel very goofy or “drunk”. And don’t get me wrong I’m not saying all of this because I wouldn’t do it again because I love a challenge and I love things that are hard and I love prep. I love every minute, every sleepless night, every hunger pain, every dazed grocery store adventure, every workout, and every time I step on stage. It’s all a process and I love everything about it but it’s not all sun shine and rainbows and I want people to hear that. You will be alone a LOT because it’s too hard to be around food and honestly between workouts, posing, and work you have very little extra time during the day for anything else. I also want to touch on what competitors know as the “Post Show Blues” after a competition. If I eat too much sugar after my show I go though a “depression” phase that is very hard to understand. I’m a super happy person all the time so to feel despair and sadness and have no idea why or how to change my mood is hard. Good news is it doesn’t last long and I avoid it by avoiding sugar post show! UNSUPPORTIVE FRIENDS AND THE STRUGGLES OF PREP! This week the ADO Fitness trainers are addressing how their lives have been negatively impacted by fitness, to spread some light on issues not everyone speaks about Coach Joey shares her story. When I first started working out and eating healthy I most definitely was not as intense as I am currently. In the beginning many people were supportive and really didn’t think much about it. As I became more knowledgable about different foods and exercises I became more invested in it then when I started. This was when I noticed my friends and even family becoming less and less supportive. I would have to say this is the hardest part of being in this industry and living this lifestyle. When you absolutely love something so much and want to do nothing but that it becomes very hard to understand why your loved ones just don’t “get it.” You will see yourself not invited to some gathering or parties because automatically people assume you won’t eat the food or that you will judge them for eating it or drinking alcohol. When in reality I could care less what others are eating or drinking. Everyone needs to do what makes them happy. To me it is all about the time being spent with one another, not the food or drinks being consumed. I have gone to gatherings and have many people make comments like “oh you won’t eat that or you can’t have that.” Many people don’t realize it is not the fact if i can have it or not it is because I simply do not want it. I have chose a lifestyle that entails me of eating things that others may not enjoy. I never make comments to others about their foods which is why I think that this is one thing that really does get to me at times. Now when I decided to compete and start my first prep this all became even harder then just the regular day to day stuff of just eating healthy and exercising. My circle of friends has became very small. This can be tough sometimes because lets face it, it can get lonely. People around me really didn’t see the point of me putting my time and money into a hobby that is expensive and time consuming. Then you win a trophy and you get no money back, that was always the response. Although how many people play golf, hunt, etc that all cost a lot of money to do. This prep I am currently in has been the hardest I have ever had in my life so far.I had 8 weeks of staying at a weight that was just very uncomfortable for me. I realized I can’t eat dairy or many vegetables because they are bloating me.This all does become annoying. I can’t just eat whatever I want now. I’m used to having the flexibility with IIFYM and now I have to be more cautious with food choices which can get frustrating at times. Like everyone else, I do crave unhealthy foods at times and do not want just lay in bed all day doing nothing. But I know deep down I won’t reach my goals unless I push myself. I am lucky i have a great team behind me telling me to not give up because as well all stress “trust the process”, it really does work. I did just that and eventually my body responded and I’m almost ready to compete in my first show for the season. But I will say many times I questioned the process myself even though I preach it daily. It becomes very difficult to see yourself putting in SO much hard work, eating every macro to the T and doing EVERYTHING you are supposed to with seeing no changes. In due time my hard work paid off. Another issue for me this prep has been sleeping. I never truly get great sleep but this time it is much worse. I am typically averaging 4 hours a night. Sleep is extremely crucial for health and when you’re in prep it is a MUST. I have incorporated hot tea, baths, and ZMAs for sleep. Sometimes these things work but sometimes they don’t. No prep will ever be the same which is why I have to be prepared to just work hard no matter what. Now most people will probably ask “Why do this when you have these kind of issues ?” The answer is because I love it! I may have my downs with being in the fitness industry and with prep but I am positive that all of my ups outweigh my downs. I literally eat, breath and live this lifestyle and do not regret it for a minute. I have my “real” friends who will stand by my side no matter what. I still have some family members who don’t really get it but they know I’m not going to change and I know they won’t either, which is totally OK! I always stay true to myself and remember that no matter what I want to accomplish it will require me to make sacrifices of some sort. In the end we all have to do what makes up happy and excites us to wake up everyday. Living this lifestyle, being a bikini competitor and being in this industry do nothing but make me excited to wake up daily and that is all that matters. This week the ADO Fitness trainers are addressing how their lives have been negatively impacted by fitness to spread some light on issues not everyone speaks about. Coach Lauren shares her story. I wanted to write this when I was just under two weeks out from NY Pro, because Amber suggested this topic during the last final weeks of my first prep of 2016 and I was definitely riding the prep rollercoaster. Fitness turned my life around in many ways for the better. I am forever grateful and know that it will always be at the foundation of my life. I love the way I feel and that I have the opportunity to positively impact those around me. Whether you compete or not, fitness can become a bit obsessive. Yesterday (5/11/16) was a rough day for me prep wise. I was starving, low energy… It was one of those days when you almost laugh and think “WHY am I doing this?! This is my hobby??! !” But it is ultimately, all your hard work pays off and every grueling second you spent in prep all becomes worth it when show day has arrived… either because you have “made it” and pushed yourself to the mental and physical limits or because you’ve improved on your last package, regardless of placing. This isn’t the case for everyone. Some people don’t seem to have fun when they are competing… but I have an ABSOLUTE BLAST. I love it… and I get addicted. This is where fitness starts to run my life a little bit. I want to make plans into the future, but I have made my competing and ADO Fitness a priority. Suddenly vacations, trips and other things start hinging on “if I will be in prep”. I was pretty proud of myself when I made the trip to Wisconsin over the holiday season despite being “in prep” (for a show I never competed in). Your life is so routine that even if you’re “on point” being in a new environment can make you feel like you’re not. The thing that I have disliked the most about this last prep (and is an issue every prep) is losing sight of yourself. I am normally an incredibly confident woman… and I love the way I look… however, when you put your “competition goggles” on as I call them, you are suddenly aware of every “flaw” on your body. Your face begins leaning out, chest becomes boney and you’re sitting their wondering if you’re lean enough. THAT is what I dislike the most. Losing sight of yourself. That’s why coaches need coaches- to keep you in check. I think when you’ve been the leanest you have and probably ever will be in your life- you always compare it to that… Eventually post show and a couple good pumps with all those yummy carbs and I’m able to see that I AM lean, suddenly maybe even TOO lean… when you’re building you want to be lean and when you’re lean you want to be building! Rationally, I know I look fantastic… but you start chasing this “stage lean” look and start questioning your appearance. Follow Lauren on YouTube for more helpful information! 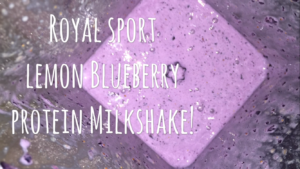 This Royal Sport Ltd Lemon Blueberry Protein Milkshake really hits the spot after a great workout!!! 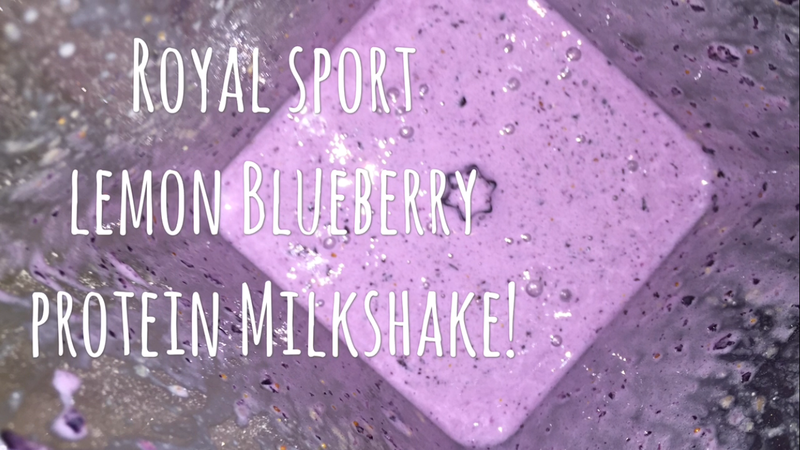 Add everything in your blender and blend until smooth!! 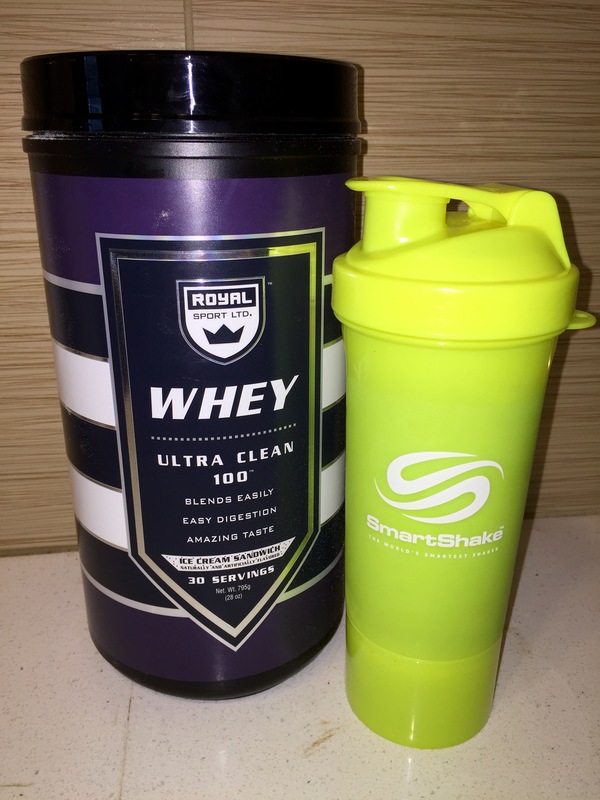 Pour into your SmartShake and enjoy!! Absolutely delicious Snickerdoodle Avocado Brownies topped with Snickerdoodle Buff Bake Nut Butter!!! And spray coconut oil spray on baking pan. Fill a pan with water and bring to a simmer. Then you’re going to take a glass bowl and put it into the water making sure none of it gets into the bowl. Add in the chocolate chips and coconut oil and stir until melted and set aside. Blend up your avocados until they are smooth and creamy. 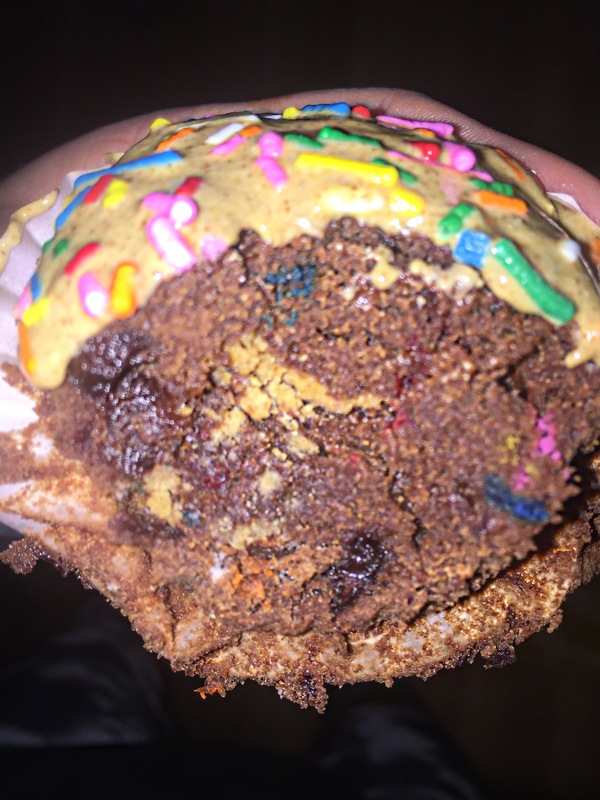 Combine all avocado, honey, vanilla, and eggs in a bowl then mix in your coconut flour and cocoa powder until smooth, then add your melted chocolate chips! Finally pour into your greased pan and put into the oven for 20 mins! 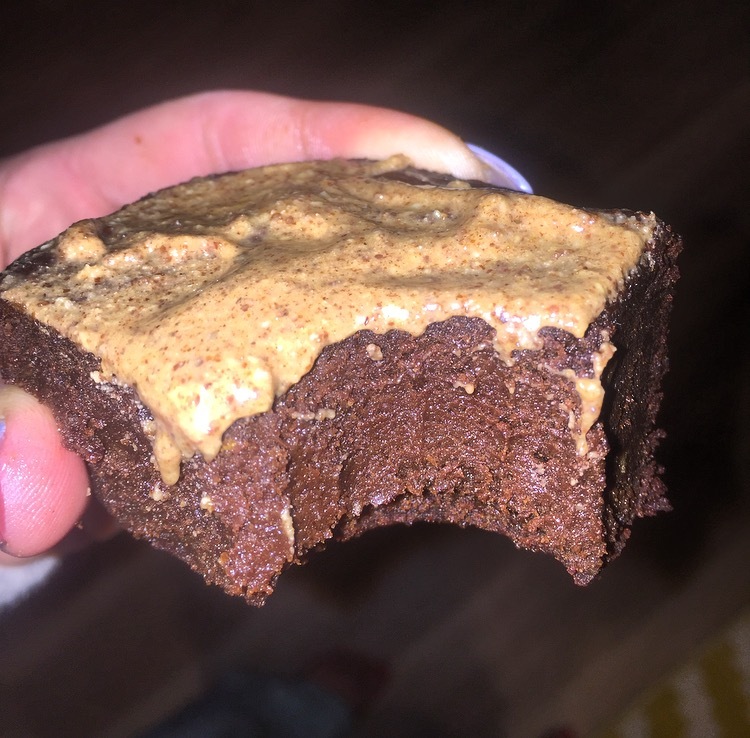 Remove from oven and let cool before topping with your favorite Buff Bake nut butter and try to resist the temptation to devour the entire pan!